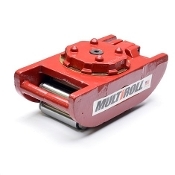 The Mark TL4 Roller Skid uses steel chain rollers which help move extremely heavy loads across uneven or distressed concrete floors. Each unit has a turning lock (TL) which prevents the Swivel-Top from turning, unless unlatched by the T-BAR TL Handle (which is sold seperately, photo's with bar are for illustration). Built to last, with superior workmanship and materials. A must have for every shop.